Welcome to the Chicago School of Guitar Making. Here you can learn instrument repair, design and making directly with a professional luthier in their workshop. We also teach tube amplifier electronics. CSGM was founded in 2005. Since then, thousands of students have enrolled in CSGM classes and started careers as Luthiers, Technicians, and craftspeople of all stripes and scopes. GREAT workshop this weekend, it exceeded all my expectations. The playlists and the shop humor were right up my alley too, pitch perfect (ditto for Mike). I was especially pleased that Dane was able to walk out with a killer functioning amp, he is so stoked about that. A great learning experience for him for sure, it really pushed him and it paid off. For me (as I said when we were leaving), I kind of didn’t expect to completely finish a Princeton Reverb way back when I signed up, but I can now see the finish line and will enjoy the final steps at home (many thanks Kye for jumping in and getting so much done Sunday PM!). If I get totally stuck, or just run out of life-bandwidth I’ll ping back and mail the chassis back to you for professional finalization. BTW, I was able to finish off my Princeton Reverb after I took the class. Works GREAT, I gig with it every week. I might try to take your Amp Repair class this summer (assuming I can get the time off work). Workshops are offered throughout the year. A new schedule is released every six months. Courses are scheduled on consecutive days or evenings, as One Day seminars and also as extended day time immersion workshops during summer. Summer workshops offer an outstanding immersive making and learning experience. Here the ambitious student make use of the extra time and guidance available to see a complex project to fruition and make large strides toward developing advanced skills within a very short time. All of our courses are offered during year-round weekend and summer day long workshops. These meet in the morning to early evening. Start and end times will vary with each course. A catered lunch is provided and included in the fee for any day-long workshop. Full weekend workshops give added value, as they offer many more hours of guidance from the instructor and hands-on time in the workshop. Evening workshops meet 7 pm to 9:30 pm on consecutive Tuesdays through Thursdays, are offered year-round and include all of our courses except Tube Amp Building and Tube Amp Diagnostics and Repair. The school is located at Specimen Products, 1240 N. Homan Ave, Chicago IL, 60651. The school’s workshop is outfitted with luthiery workbenches stocked with all of the specialized tools and supplies necessary to complete any of the projects underway in our classes. Guitar workshops are part of our foundation curriculum and are structured to teach students the essentials of guitar design, construction and repair. All of our foundation courses provide a good groundwork for anybody interested in building their own custom guitar. Electronics workshops teach the fundamentals of audio electronics circuits and the construction techniques used in any electronics assembly or repair project. In addition to offering the student work space, tools and guidance to see them through a chosen project, these workshops prepare the student to approach electronics projects mindfully, from the perspective of an electronics professional. Depending on the students desired focus, we offer suggested bundles of curriculum to suit their specific needs. Classes listed in bundles are not necessarily in a specific order. 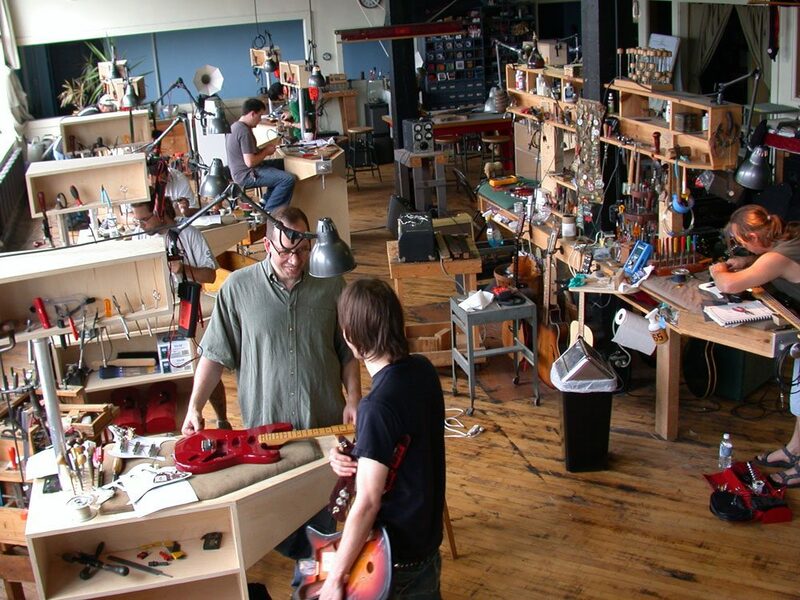 In 1986 Ian Schneller founded Specimen Guitar Shop as an artist studio where he would design, build and offer his own line of custom guitars and tube amplifiers, and provide custom guitar services and repairs. Later, Ian established Specimen Products as a division of his custom guitar shop to expand into a design and production firm. Here he would create and produce a variety of unique handcrafted items, from whimsical to artfully utilitarian. Specimen Products’s centerpiece is the AUDIO LINE. Ian’s own designs of handmade Horn Speakers and Hi-Fi Tube Amplifiers. Ian’s arrays of Specimen Horn Speakers have been exhibited as Sonic Arboretum in a partnership with Andrew Bird at major museums on the U.S.
Ian established the Chicago School of Guitar Making in 2005, devising the school’s entire curricula, teaching all the courses, creating the area’s only school of luthiery. Since its inception, Ian has taught most CSGM courses, giving hundreds of workshops, tutoring more than 2000 students, and training dozens of apprentices. Ian is a graduate of the School of the Art Institute of Chicago, MFA, and the Memphis Academy of Arts, BA. Ian has taught Sculpture at SAIC. Kye Kennedy is a master amp electronics and stage technician, working primarily in Nashville. Kye created and teaches the school’s Tube Amp Diagnostics & Repair curriculum. For course details, fee and registration, please select a class from Workshops. The CSGM Newsletter announces the school’s schedule and news and is delivered by email. To receive the newsletter, please enter your email address in the Newsletter Sign Up box which is found in the lower right hand corner of this web page.